2012 1041 is not the form you're looking for?Search for another form here. Form 1041 or as it is officially called U.S. Income Tax Return for Estates and Trusts is used by the estates and trusts respectively. What is form 1041 for? Form 1041 is used to report income and all the expenses of the estate or trust. But it shouldn't be confused with estate tax return, which is form 706. The difference between the them is that form 1041 is an income tax return that reports the money earned by the decedent's estate or trust left after his or her death. Is form 1041 accompanied by other forms? 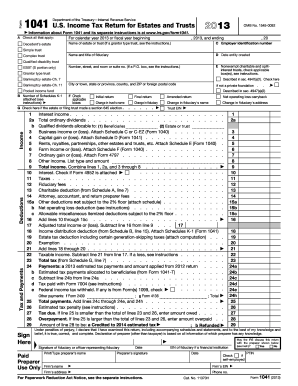 There is a list of forms that may be required to accompany form 1041. The most important are W-2, W-3 forms. Check out the full list of the forms on IRS official website. Besides there are some attachments sent together with the form 1041. They follow the form in particular order. See instruction to the form to learn what attachments to include. 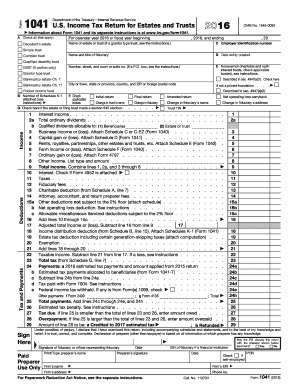 When is form 1041 due? Form 1041 must be filed by the 15th day of the 4th month following the close of the tax year. General due date for filing income tax returns is April 15 unless it falls on a legal holiday, Saturday or Sunday. 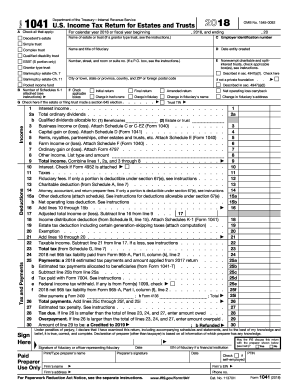 How do I fill out form 1041? Read the detailed instructions on the IRS website to fill out form accurately. Where do I send form 1041? Completed form 1041 is sent to the address depending on your location. Another fact that defines the address where to send form 1041 is the paycheck that may be attached to the form. Bill Text - SB-1041 Human services. Estimated tax payments allocated to beneficiaries from Form 1041-T. Subtract line 25b from line 25a. See instructions. 1d Adjusted tax-exempt interest.